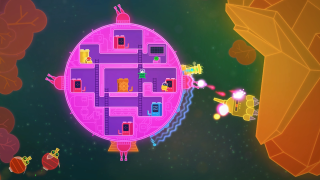 Try as I might to figure it out, I can't quite put my finger on what you actually do in Lovers in a Dangerous Spacetime. Evan described it last year as Mario crossed with FTL, a local co-op game, and "a miniature, cooperative platformer inside of a shmup". All those things sound amazing, but I think this is the kind of game that will only make sense when you get your hands on it. The video embedded above is the opening cinematic for the game, which launches September 9. As an opening cinematic it doesn't demonstrate how the game plays, so if you're looking for that this E3 trailer should suffice. While the focus is on local co-op, you can also play with AI. It unlocks on Steam tomorrow.